Second time is even better than the first Just wanted to say that we loved our second stay at this rental. We were there during the "big storm" in March - lots of thunder and lightning, flooding and three days of torrential downpour. The house stayed dry and cozy and is comfortable and spacious enough that we almost didnt mind being housebound for three days. Love having all those sand and water toys at our disposal for when the rain finally stopped. It definitely helps when you are traveling with little ones like we were. We also enjoyed watching all the geckos in the bush outside of the kitchen window. We love how close to the beach this rental is and yet how quiet it is. The only thing we wished for is small plastic cups for the kids. Given the granite tile and glass dining table, its a little nerve-wracking to have your three year old using glass tumblers. A step stool they can use to wash hands with in the bathrooms would also be very helpful. All in all though - another terrific trip to our favorite place in the Hawaiian Islands! Owner response: Thanks so much for your comments. We are so happy you have returned again. Great to hear you weathered our really big storm in comfort. That was a doozy! Next time you come, you will find plastic cups for the kids and a step stool which have been put in the house. These items will be a great addition that all of our future guests will enjoy. Much Aloha! Happy in Hanalei We arrived to find this home spotless and well equipped. The outdoor shower was a bonus when arriving home from the beach every day to de-sand! I wish it had a little more privacy however, and we would not have used the inside shower at all! The lanai was perfect for evening dinners. We were pleased to find an adequate beach towel supply and a very efficient washer and dryer. The weather was warm during our stay but the extra floor fans along with the ceiling fans kept things quite comfortable, even upstairs in the loft. We found it an easy walk to the beach from the house mainly on quiet, residential streets. Always a fantastic experience. This is the 2nd time we have stayed on this property, the first being in the upstairs beach house. The old style is perfect for a couple with kids or without. Although there are 4 bldgs on the property, you always feel secluded and private. Literally steps from beach, which never seems too busy, and a short walk to the lifeguard station, the Old Style Beach house is a pleasure to stay in. Everything is clean and ready to go, there are usually some basic items in the pantry and fridge. While not new, the kitchen is functional and as I mentioned, clean! If you are arriving late and its your first time i suggest getting some supplies in Kapaa on the way to Hanalei. Caveat about the surf in front of the house: there can be a strong current during the winter months - just keep an eye out for signs and walk down the beach 5 mins towards the lifeguard station / public beach access. You can get into trouble if you are not a strong swimmer! If you are looking to surf, world class breaks are nearby, and if you are looking to learn, a 20 mins or so walk to the pier and you will find lessons. There have been gentle upgrades on the property since we were last there which is really nice. The communal washer/dryer is awesome to have. It is run by people who care about what they do and their guests. We will return! Will Be Back This home was even nicer than the pictures and descriptions. There were 6 of us (grandma/grandpa, mom/dad, 2 kids under 3) and we had plenty of space. A bathroom for each bedroom was a real plus. We stayed for 10 lovely days and went to the beach every day! Our favorite was Tunnels. We especially loved the views of the waterfalls from the kitchen window (it made washing dishes not so bad). It rained pretty hard overnight a couple of times, and each time it did, there were new waterfalls in the morning! Kauai is our new favorite island, and we would love to come and visit Hanalei again. We would definitely stay at the Hanalei again too! North Shore in November. We enjoyed our stay. Nice views of the golf course and ocean on this end unit. Kitchen was fully equipped. The condo was comfortable and convenient to the pool. 5 min walk to the Westin and Starbucks. 15 min walk to Anini Beach. Hanalei is just down the road. There are lots of secluded small beaches in the area, hiking, horseback riding, etc. Princeville is quiet and laid back, just what we needed! We would stay here again. Peaceful, clean, modern, as advertised! We spent a happy week at Paani. The condo is spacious, in excellent condition, and convenient for all North Shore sights and beaches. Puamana is a quiet complex, and no golf is played near the house. Highly recommended for a peaceful stay in Princeville. Enjoyed our stay Four of us (two couples) stayed in this condo for a week and we had a very pleasant experience. One bit of advice: The wood floor in the upstairs bedroom creaks when you walk on it, so best not have late night types upstairs and early risers downstairs! A Great family experience!! We had the best vacation ever. What a great family vacation in a perfect location. We have been visiting Kauai for the past 40 year and even owned a Condo on Princeville, and I would rate this stay the best. The location is perfect and centrally located between the great hanalei beaches, town, and all the other great thing on this side of the island. Well definitely use any of the Kobyashi Beach Housed again. Mahalo and Aloha. My Response Mahalo. Love to hear from seasoned travelers! Be glad to have you back! Wonderful vacation! Pros: Location!! Great remodeled kitchen had everything a cook could want, beyond fully loaded! Comfortable beds Nice, remodeled bathrooms Ocean, mountain and golf course views Cons: Sleeper futon in loft was a bit small (full/double, not a queen) for my 2 young sons to sleep on (7 and 9 yrs) Some of the screens were bent and would let in a mosquito or two, not a big deal as there are many windows to open to get the trade winds The curtain rod in the master falls to the floor with barely a touch The towel rod in the downstairs bath falls off easily, too (didnt know until I saw bruises on my moms foot) Favorite things: Hanalei Bay Path to Anini Beach North Shore Hiking Na Pali Coast Bike/walking path in Kapaa (we suggest renting bikes and riding along the coast) The cons are so petty, its still a 5 star review. This was our 3rd trip to Kauai and we prefer the North Shore for its quaintness (Hanalei) and less tourists (Poipu). The location is fantastic. It was so great to walk to Anini Beach without having to pack a lunch or much of anything. Shopping and eats are just a short drive or leisurely stroll away. Beautiful views are endless: from the lani overlooking the golf course & ocean, mountain views if you turn the other direction and from the top of the path looking down to Anini. The pool is small, but our kids didnt care. They had a great time splashing around. We hope to return to Kauai soon and this condo will top our list to rent again! Thank you so much!! Beautiful! 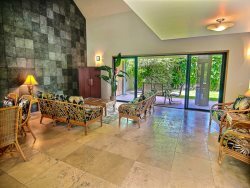 I had never been to Hawaii nor used VRBO and decided to do both with 2 friends. We were a bit skeptical as we began looking through all our choices...this location seems too good to be true. We even called Suzanne and Teri to make sure it was all that was written. Well, it was! We had an amazing time and the condo was great! Big and open and airy! The winds blew through the doors and windows at night and made the sleeping possible. It was clean and well furnished. It supplied everything that we needed. The location was fantastic! Sunset over the golf course and the short walk down to Anini Beach! We even walked to Queens Bath. It is close to Hanalei which made our excursions easy as well. The Westin, next door provided Starbucks coffee in the morning when we chose not to brew our own. All in all, our stay at Paani was fantastic. The only downfall was the pool at the complex itself, but with the beautiful beaches in the area, we didnt care in the least! I would stay here again and recommend it to others! Thank you for the opportunity! Perfect spot, perfect hosts Paani is the best place we stayed in in our 4 weeks on the Hawaiian Islands. The house was perfectly clean when we got there, its equipped and furnished beyond imaginable, the view is exquisite and the host were helpful beyond possible. Although we havent met them in person, they would answer to our emails promptly and we had a phone number to call anytime if anything wouldve happened. On Kaua, I would definitely advise any travelers to stay on the north shore and to those I would recommend Paani house with eager willingness! Thanks for a wonderful stay at the Old Style Beach House. What a location...just a few steps from the beautiful Hanalei Bay beach. We had a great time surfing in the morning, taking our cocktails down to the beach to watch the sunset and cooking barbeques on the porch in the evening. Only a short walk to the cute town too. Relaxation at its best....beats all the big resorts hands down!! My husband, John, and I really enjoyed the "Old Style". It felt spacious yet cozy. The view was wonderful, and with the beach right out front it was easy to get up early for "dawn patrol" on the water. Well be back. Old Style Beach House was a wonderful place to stay. We felt like we could stay forever in this bit of paradise. Right on the ocean at the quiet end of the beautiful bay, everything you need is here. Wonderful Cottage in a Beautiful Place We stayed a full week at Old Style over Thanksgiving week. What a great place... small but not too small, quaint, clean and well equipped. A beautiful view of the ocean just 30 yards away. The sound of crashing surf. A short bicycle ride to down town or the pier. We will be back! Super location and neat little bungalow We enjoyed the grassy landscape with the beach an easy stroll. The rain sounded nice on the rooftop. The bungalow had a sweet open floor plan and our daughter said the bed was very comfortable in the living room. We would do it again. As advertised We visited to celebrate our tenth anniversary with our six year-old and had a fabulous stay. This property is depicted accurately. It is not fancy, but the location cannot be beat and it has everything you would need to enjoy Kauai. It is absolutely immaculately clean. There is shared coin-op laundry in a separate outbuilding on site. The unit features two twin beds in the living room and a separate queen (king?) bed in the master bedroom. There is a grill and beach chairs are provided. No bikes are provided, which is a very minor downside, but they can be easily rented. The enormous oceanfront lawn is shared by I believe four properties and leads directly to Hanalei bay beach. It is about 3/4 mile into "downtown Hanalei", easily bikeable or walkable through an exclusive neighborhood. No housekeeping, which was a plus for us, as we did not want to be bothered during our stay. If you want granite countertops, stainless steel appliances, a whirlpool tub and double vanities this is not your place and you should look into staying at a resort. I would absolutely stay here again. This was our 8th trip to the Hawaiian Islands and this was easily my favorite place including several other beachfront properties and 5-star resorts. mahalo, terri and suzanne! We will be back as soon as possible! A little piece of paradise A little piece of paradise Guest: Dee () Date of Stay: 07/22/12 Review Submitted: 08/01/12 We recently spent a month in Hawaii and the Old Style beach house was by far the most relaxing, clean and appealing accommodation that we stayed at. If I could move there permanently, I would. The accommodation catered to all our needs, beautiful and tranquil surroundings. Thank you, we would recommend this accommodation to everyone wanting a piece of paradise. Cant wait to return We just returned from an 8-day trip to Kauai. We spent the first four nights at The Old Style Beach House and I cant think of a better way to enjoy a visit to this island. The location is simply unbeatable: right on the Bay with just a nice grassy lawn and a few palm trees separating you from that warm Hawaiian water. The house was immaculate and looked exactly like the pictures. As other reviewers have mentioned, its not The Four Seasons, but its homey and totally comfortable. A basket of local treats on the kitchen table was a really welcoming touch too. It was so nice to wake up early in the morning, make some Kona coffee in the kitchen, look out at that view and then explore the beach. Some days we were the only people on the sand! We were traveling with our two school-age kids, so it was really nice to have a little more space than we would have in a hotel room; having a fully stocked kitchen for cooking at the house certainly made life easier (and saved some money too). Suzanne and Terri made booking easy and the directions were very clear, Gosh, even reading the directions is enough to make me want to book a flight! From the house youre in easy walking distance to town and the Hanalei Pier with its crystal blue water and Pats Taqueria, which was hands down the best food we ate on the island. Our kiddos loved the smoothies at Hanalei Taro & Juice Co. Youre also a quick car ride away from Tunnels, where we saw Monk Seals, sea turtles and some really colorful parrotfish while snorkeling. After we checked out we headed down to Poipu. After spending four days in Hanalei it felt like Disneyland. Even though we were staying at a five star resort with beautiful grounds and marble bathrooms, I found myself missing the Old Style Beach House. You just cant beat the natural beauty of the North Shore & the easygoing vibe of Hanalei, and The Old Style Beach House is the perfect place to enjoy it. Our family declared this the best vacation ever, and we cant wait to return to The Old Style Beach House.